Three friends dream up the Compaq portable computer at a Texas diner in 1981 and soon find themselves battling mighty IBM for PC supremacy. 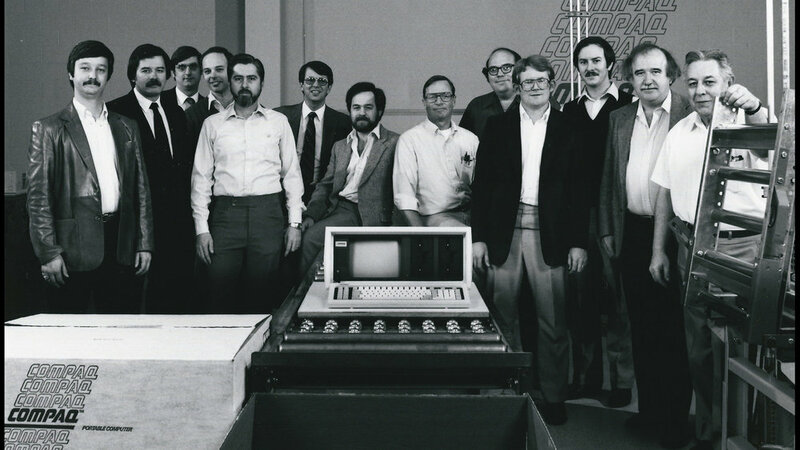 Their improbable journey altered the future of computing and shaped the world we now know. Silicon Cowboys explores the remarkable David vs. Goliath rise and eventual demise of Compaq, an unlikely upstart who altered the future of computing and helped shape the world as we know it today. Directed by Oscar-nominated director Jason Cohen, the film offers a fresh look at the explosive rise of the 1980's PC industry and is a refreshing alternative to the familiar narratives of Jobs, Gates and Zuckerberg. A vivid and evocative portrait of an era when innovators might rough-sketch their grand plans for PCs of the back of restaurant placemats, then rely on bank loans, not venture capitalists, to turn dreams into reality. It tells a fascinating story — complete with cautionary references to the ways that corporate success can fray family ties, and visionaries often are superseded by bean counters. Cohen skillfully uses Ian Hultquist’s pulsating electronic musical score to sustain narrative momentum, so that “Silicon Cowboys” winds up seeming even shorter than its 76-minute running time. Director Cohen, whose “Facing Fear” was among the 2014 Oscar nominees for documentary short, lends this classic David versus Goliath story a playfully retro feel complete with old TV clips that look like they were recorded on VHS and a beep ’n’ blip-heavy electronic score by Ian Hultquist that could have easily come from a vintage Nintendo game. You won’t walk away with a degree in business or psychology after watching “Silicon Cowboys.” But this documentary leaves you with a curious feeling that you’ve earned college credit in both, and gotten a few laughs as well.